Immunologists at St. Jude Children’s Research Hospital have discovered that a protein called NLRC3 plays a central role in inhibiting colon cells from becoming cancerous. 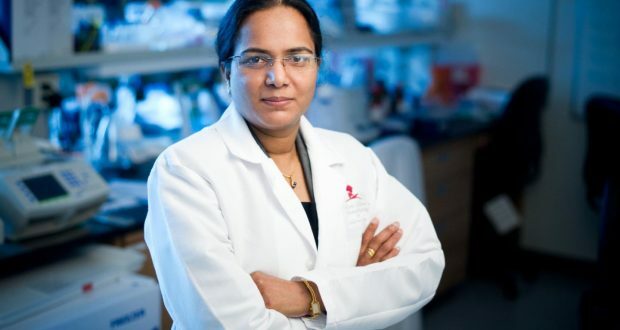 The study, led by Thirumala-Devi Kanneganti, Ph.D., a member of the St. Jude Department of Immunology, appears online today in the journal Nature. Researchers found that deleting the protective NLRC3 protein exacerbates colon cancer development. They also identified key molecular components of the NLRC3 tumor suppressing pathway, offering targets for new drugs that restore the protective mechanism to treat colon cancer. NLRC3 is a member of a large family of NLR “sensor” proteins that regulate immune and other cell functions. However, until now, the role of NLRC3 in protecting against cancer development was unknown. Previous studies showed that tumors from colon cancer patients exhibited drastically reduced NLRC3 gene expression. Detailed analysis by Kanneganti and her colleagues revealed how NLRC3 regulates molecules in a key cellular pathway called the PI3K-mTOR pathway, which controls cell proliferation, immune response, inflammation, and cancer. Using an induced colon cancer model, Kanneganti and her colleagues found mice that developed tumors showed significantly reduced NLRC3, just as human patients did. The researchers also found that NLRC3-deficient mice were much more prone to colon cancer. What’s more, a mouse strain with a tendency to develop colon polyps showed much greater tumor development when they lacked NLRC3. In other studies with mice, the researchers established that NLRC3 acted mainly in epithelial cells in the colon, showing the protein’s direct role in protecting the gut against inflammation caused by infection and colon tumor development. In studies with human colon cells, the scientists found that overexpressing the NLRC3 gene greatly reduced cell proliferation. Kanneganti said that NLRC3 likely plays a broader role than only preventing tumors. “We really do not know its role in infectious and inflammatory diseases,” she added. Rajendra Karki, of St. Jude, and Si Ming Man, formerly of St. Jude, are the paper’s first authors. The other authors are R. K. Subbarao Malireddi, Sannula Kesavardhana, Qifan Zhu, Amanda Burton, Bhesh Raj Sharma, Xiaopeng Qi, Stephane Pelletier and Peter Vogel, all of St. Jude; and Philip Rosenstiel of Christian-Albrechts-University Kiel, Germany. The research was supported in part by grants (AI101935, AI124346, AR056296, CA163507) from the National Institutes of Health and ALSAC.